Jason Anspach presents the third book in the Rockwell Return Files series. When local baseball player Junior Jones receives death threats over the color of his skin, the team's wealthy owner hires Sam Rockwell to solve the case and stop a murder before it happens. Sam goes undercover as a minor league pitcher to strike out the culprit. Follow the clues along with Sam's curmudgeonly ghost of a father Frank Rockwell, and Sam's wife Amelia, who holds a secret that will forever change the lives of the entire Rockwell family. 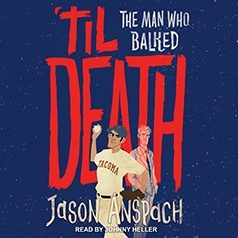 It's another laugh-filled, madcap mystery in the warm, witty 1950's Hollywood-style of author Jason Anspach.